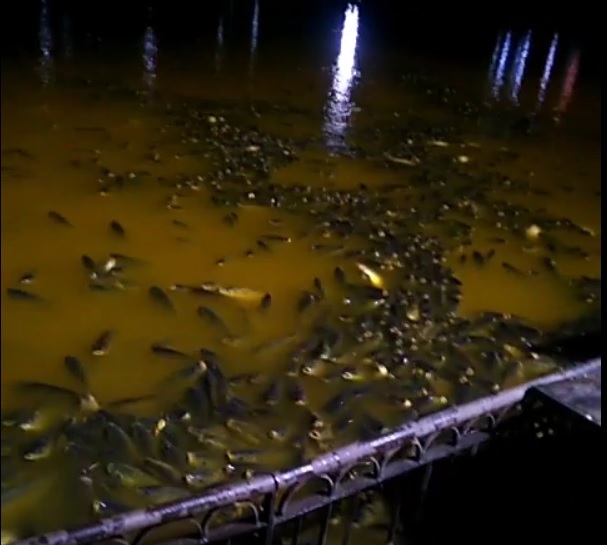 Thousands of fish were found dead in Rewalsar Lake on Tuesday night, raising serious concern among the inhabitants living in the area. The lake has special religious importance in the district. Sudden change in colour of the lake water was observed as it turned filthy during the last two days. could be seen late yesterday. The district administration officials rushed to the spot and disposed of the dead fishes to avoid any health hazard to the inhabitants of the region. Experts feel several factors could be responsible for the death of the fishes. Lack of adequate oxygen in lake water could be the key reason. Pollution level was increasing gradually in lake water. Besides, devotees offer feed to fish round the year. Rewalsar town lacks sewerage facility and there are apprehensions that the seepage from sewerage tanks of local households into the lake was harming its ecology. Additional Deputy Commissioner Mandi Harikesh Meena, who visited the spot, told The Tribune that preliminary cause of fish death on such a large scale was reported lack of oxygen in lake water. "The district administration has decided to impose a complete ban on feeding fishes in lake water, while other preventive measures will be taken to protect its ecology as the lake has huge religious importance in the region", he remarked. The officials of the Fishery Department and Pollution Control Board visited the site to assess the situation. They collected water samples from the lake. Thousands of devotees took dip in lake water on Baisakhi as it is considered pious. The place has religious importance for Hindus, Buddhists and the Sikhs. Three Buddhist monasteries and a gurdwara are situated at Rewalsar.